The aim of the team is the synthesis of bioactive surfaces to favour membrane adhesion (cells, microvesicles, …) for biological engineering (biomaterials, tissue engineering, drug delivery, diagnosis, …). A special focus is made on vascular and bone tissue engineering, regeneration and repair which need original approaches of surface treatment of the materials to promote adhesion, cellular communication, and regeneration of tissues. Three strategies will be used to study in vitro the preservation of the human Mesenchymatic Stem Cells (hMSC) stemness and the production of mature osteoblastic cells (OB). A fine understanding of conditions required to promote specific differentiation towards OB's, or the preservation of MSC's stemness, is still lacking, especially as regards the optimal way to fine-tune the nanoscale morphology of the surfaces onto which cells are cultured. This research axis will focus on the influence of controlled (by using nanoimprint lithography and block copolymer self-assembly) nanoscale morphologies of titanium (variation in size, distribution [periodic/aperiodic], edge-edge separations, and aspect ratios of titanium or Ti-6Al-4V nanostructures) to hMSC fate. We hope to draw meaningful correlations between nanomorphology of titanium and hMSC behaviour. Finally, the titanium surfaces will be functionalized by grafting cell adhesion or cell differentiation peptides or incubated with osteoblast microvesicles and the impact of these surfaces on hMSCs adhesion and differentiation will be studied. Collaboration with Gabriel Lippmann Institute (Luxemburg) and SCREVO Co. (Netherlands) who have expertise in Micro/nano-patterning of materials and implantable 3D porous scaffold systems respectively. This program is funded by European Joint Doctorates (ITN) Call. The objective of this project is to enhance the osseointegration and endothelialization of orthopaedic and vascular biomaterials respectively by grafting specific active principles (cell adhesion, differentiation peptides, specific antibodies to favour recruitment of cells) with controlled spatial distribution at the micrometer scale (size and shape controlled by photolithography). Our objective is to synthesize smart bioactive materials that aim to mimic the native ECM of tissues (bone, vessel) and help us to understand their impact on progenitor endothelial and hMSC. This work focused on bone tissue involves 2 PhD students (I. Bilem and L Padiolleau both in cotutelle with Laval University (Québec)). This work is funded by the GMN NSERC Create Program on Regenerative Medicine and IDEX. 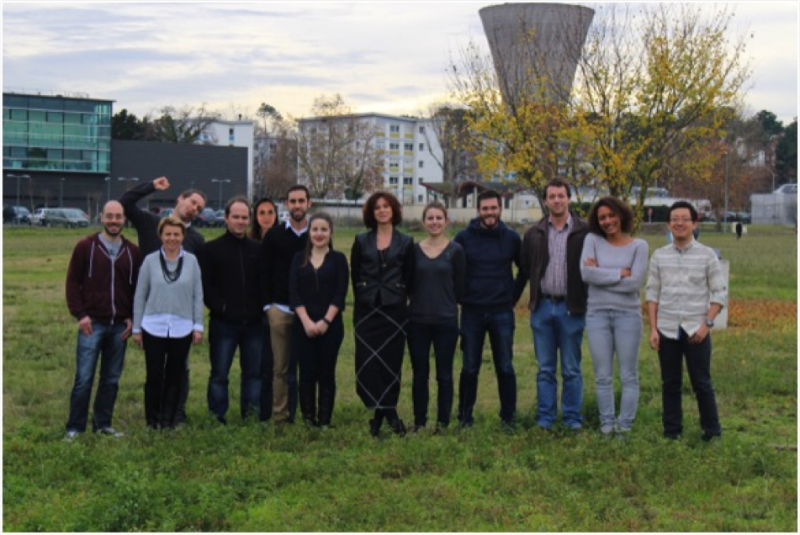 This work focused on vascular is funded by “Région Aquitaine” since 2014. Caroline Royer, PhD student is involved in this program. This research axis will focus on the design, synthesis and elaboration of controllable (periodicities, diameters, chirality) helical organic nanoribbons based on self-assemblies of Gemini-type amphiphiles, entitled Smart Synthetic ExtraCellular Matrices (SSECM), which could present the same order of dimension and periodicity as collagen fibers inside the ECM. The objective is to evaluate the influence of the bioactive SSECM (functionalized or incubated with various active principles [cell adhesion peptides, cell differentiation peptides and microvesicles well-known by our team]) to hMSC in order to reproduce the role of native signaling biomolecules in term of phenotype, function and differentiation into mature specialized cells (adipocytes, chondrocytes and osteoblasts). G.Kemper (PhD with a Erasmus Mundus scolarship in cotutelle with U.Waterloo (Canada)) startedworking on this projectin Oct. 2013. B-1-Within ANR PicoBio (2009-11) and PEPSCNRS (2011-13), Pr Audoin (I2M, Bordeaux) and Dr. Durrieu developed the first applications of the Picosecond Ultrasonic (PU) technique to the investigation of cell mechanical properties at a sub-cell scale. Today within ANR PicoBond (2013-2017), we evaluate PU as a tool to probe cell adhesion. We propose to consider firstly biomimetic objects, since the cell adhesion mechanisms are extremely difficult to control experimentally, mainly due to the reorganization of the cell membrane and of cytoskeletal structure, and to the tremendous amount of proteins involved. The present project includes a new partner specialized in capsule design, UMR CNRS 8612 (Paris). A post-doc, Guillaume Le Saux, is involved in this project for 18 months (ANR PicoBond (2013-17)). B-2-Recent works on cells indicate that their mechanical properties (i.e. stress, rigidity, etc.) give information on their development and future. The study of these properties passes through systems that enable (i) to identify and characterize mechanical effects, (ii) to monitor the evolution of the cell biomechanics and (iii) to understand and control the role of the cell biomechanics on the cell functions. Thus, it is conceivable to develop organic Micro-Electro-Mechanical Systems (MEMS) dedicated to the cell biomechanics. Indeed, organic materials present several advantages: low-cost fabrication, tunable mechanical properties, biocompatibility, etc. The objective of this work is to design piezoelectric organic resonators, which are characterized by their resonance frequency and quality factor, in order to monitor in real time the evolution of mechanical properties of living cells. In fact, the resonance frequency of a resonator depends on the geometrical dimensions, the mass and the mechanical properties (i.e. the Young modulus). The cells adhesion on the resonators must lead to a mass increase and a modification of the global Young modulus, which will change the resonance frequency and the quality factor. This research program is carried out in collaboration with Isabelle Dufour, Cédric Ayela from IMS (Univ. Bordeaux). Pierre-Henri Ducrot, PhD student is involved in this program. This work is funded by the PEPS MEMOCELL. Prosthesis-related infection is described as a devastating failure scenario of an orthopaedic implant and is difficult to treat. Standard antibiotic protocols that are effective against other infections, generally fail to achieve cure in this case. The project proposed here in collaboration with Dr. Héroguez (UMR5629, LCPO, Univ. Bordeaux) consists in the controlled release (optimal rate and at correct time) of gentamicin grafted onto nanoparticles, at the site of implantation. These nanoparticles will be designed in order to respond to changes in environmental pH. A cleavage reaction of the active particle molecule bond, activated by a modification of the pH, which occurs under pathological conditions, induces a controlled release of gentamicin. In vivo experiments showed the ability to use these materials in prevention of bacterial infection (performed in collaboration with EA 3826, Nantes). Four patents have already been filled by both partners. 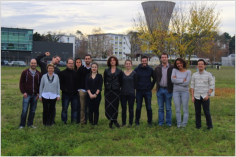 A new project was funded by Aquitaine Science Transfert (AST) started in January 2014 for 18 months with the aim to synthesize bifunctionalized materials with gentamicin and vancomycin (another antibiotic used in bone infection) as well as materials having a higher surface density of antibiotics. Today an operating licence patent is being signed with Rescoll Co (Pessac). This project was funded by ANR Emergence-Tec (2009-13) and AST (2014-15). 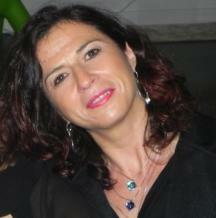 A new project (FUI, 2014-17) has been funded to enable the industrial transfer of our materials to Rescoll Co.
Angiogenesis, the formation of new blood vessels by a process of sprouting from pre-existing ones, is also a critical challenge for the establishment and maintenance of large engineered tissues. Here, an important target is to develop innovative model systems allowing to simulate the formation of blood vessels in a reconstructing bone, starting from colonization by endothelial cells forming first a closed-up channel, followed by vessel stabilization by pericytes or smooth muscle cells. Our model systems should have important characteristics such as the possibility to integrate different cells in order to mimic the different cellular layers of real blood vessels; the possibility to have cells submitted to a continuous flow as in blood vessels; and the possibility to deliver signaling cues by grafting or embedding biological factors. This project is in collaboration with Univ. of Louvain-la-Neuve (expert in nanotechnology), and it4ip Co (Belgium) (expert in nanoporosity of microchannels This program is funded by European Joint Doctorates (ITN) Call.